A study conducted by National Sleep Foundation found that 60% of children under the age of 18 complained to their parents that they were exhausted during the school day. According to their parents, 15% of those kids fell asleep during class. 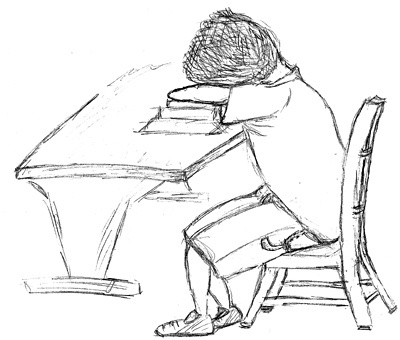 Students dread coming to school every day because they are sleep deprived. Most high schools in the United States start between 7 a.m, and 8 a.m. The school start time does not allow teens to acquire the recommended 8.5-9 hours of sleep each night, according to the Centers for Disease Control and Prevention. Most teenagers do not receive the sleep that’s recommended since they have a packed schedule that forces them to stay up late. In order to prevent the dangers of less sleep, schools need to push back their start times. Specifically, being sleep deprived can be unsafe, lead to temptations of illegal substances and caffeine, and cause car accidents. Lack of sleep decreases awareness, causing teens to become drowsy which can result in car accidents. Dr. David Yang, executive director of the AAA Foundation for Traffic Safety, states that when one is sleep deprived, as a driver, they double the risk of a car accident. Additionally, he states, “Our new research shows that a driver who has slept for less than five hours has a crash risk comparable to someone driving drunk”. Not only is five hours of sleep have the same risk of getting into an accident as being drunk, but also sleeping just six to seven hours increases the risk of crashing by 1.3% (Welch). Moreover, students who are not obtaining a healthy amount of hours of sleep tend to use illegal substances and caffeine because they believe it will aid them to stay awake. Consequently, not only are there effects and risks from lack of sleep, but to add on to that there are also risks from caffeine. Caffeine is a stimulant and side effects can include: “Jitteriness and nervousness, upset stomach, headaches, difficulty concentrating, increased heart rate, increased blood pressure and dehydration. These are unsafe because it is a diuretic, causing the body to eliminate water” (Child Mags). According to researchers at the University of Minnesota and the U.S. Centers for Disease Control and Prevention, students with later school start times are less likely to abuse drugs and overuse caffeine. Teens believe these substances will prevent them from getting in car accidents and becoming less drowsy. Above all getting less sleep than required can be dangerous for students safety. In addition to improving students safety, pushing back school start times can also improve a student’s behavior within school hours. Dr. Kyla Wahlstrom at the University of Minnesota performed an experiment on public high schools. The experiment studied schools with late start times. They found that since students were getting more hours of sleep, enrollment rates, attendance, daytime alertness, and decreased student-reported depression improved. There are many advantages that come with a good night’s rest since most brains do not start working properly until about 10 a.m (Knapton). For this reason, teens who do not get enough sleep become drowsy, distracted, not focused, and depressed. These factors can really affect how one’s day goes. Edina High School, outside of Minneapolis, pushed their start time from 7:20 a.m. to 8:30 a.m. The school found that the counselors and nurses reported fewer students needing help for emotional problems and physical complaints. Moreover, 92% of parents in Edina indicated that their teenagers were “easier to live with.” In and out of the classroom, lack of sleep is making a big impact in a student’s life mentally, emotionally and physically. With insufficiency of sleep and early start times more teens were falling asleep during class. When a student falls asleep during class they will most likely miss their work or lesson that day. Therefore, not only does sleep improve one’s behavior and make one more aware, but can help during test taking influencing their overall grade. On the whole, pushing back school start times influences a student’s behavior in and out of the classroom along with their health which is a huge aspect in a adolescent’s life. For instance, sleep is extremely critical for growing and learning. According to Doctor Judy Owens, director of sleep medicine at Boston Children’s Hospital, “Sleep is really, really critical for brain development. It’s critical for memory, for decision making, and for attention”. Teens need sleep because they are waking up far too early to ensure good health. Lack of sleep increases risk of obesity and poor metabolic regulations because, “The regulation of hormones and enzymes that help process fat and sugar are intricately linked to the optimal timing of the sleep period and sleep stages”(“Sleep Deprivation in Teens”). Sleep deprivations have manifold negative aspects on teens and make their immune system weak, therefore unable to fight colds and affecting their emotional stability leading towards depression. Above all, adolescents are at the most crucial age going through puberty and need their sleep to grow. Along with puberty, teens obtain stress from their social and academic life. A cope for stress is sleep and lack of sleep will only escalate the student’s level of anxiety. Overall, schools pushing back start times would majorly aid teen’s health and grant them more hours of sleep. All in all, inadequacy of sleep due to early school start times can affect students safety, academic performance and health. In all circumstances getting sleep is the uttermost necessary factor for every student’s health while growing, preventing the addiction to caffeine and illegal drugs, and getting into car accidents. Additionally, more sleep will be manifest in a student’s behavior during school hours and at home. Thus, everyone should be entitled to a fair amount of sleep. It is every student’s dream to dream every night.